Taken with Olympus EPL-1 digital camera July 1st 2012. Click image for larger view. The weather here in Oslo has not been the best this summer with rain showers after rain showers and some small gaps with lovely sunshine (then everyone runs out to the parks to enjoy a cold beer or two). 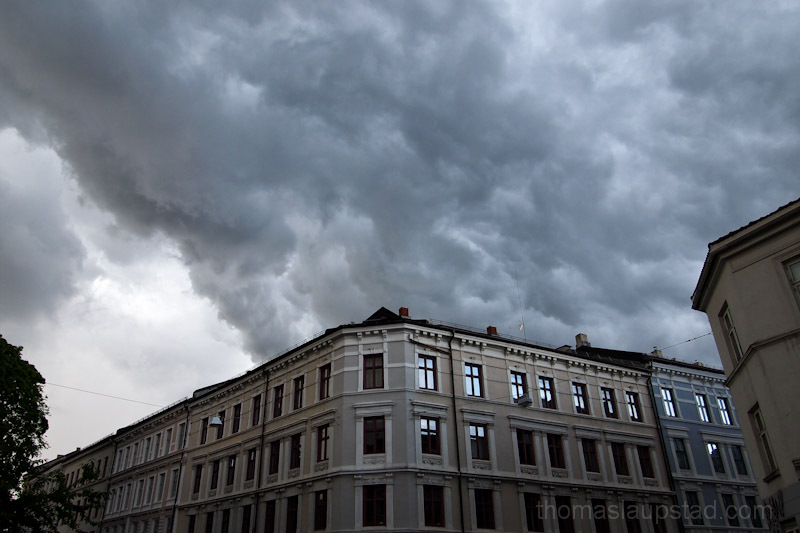 The other day I was walking in the city with my camera and these clouds were looming over us. I had to snap some pictures of the threatening clouds. Soon after this picture the sky erupted with heavy rains, and loud thunder and bright lightning. This picture was taken in a part of Oslo called GrÃ¼nerlÃ¸kka. This borough is filled with cool shops, nice restaurants and plenty of hipsters. As you can see there are also some good looking, old buildings in GrÃ¼nerlÃ¸kka. If you ever visit Oslo you should definitely visit this part of town and as a bonus there are almost no tourists there!